This fragment from a much longer poem is supposed to have been written immediately before Raleigh's impending execution; in fact he was spared for the time being, and lived another 15 years or so. I found it printed on a small blue card, in All Saints Church at Godshill. I've been vaguely familiar with these lines for many years, but I had forgotten them till I found this small card in a rack with other such things, at the back of the church, and bought it to bring home. I am not aware that the ancient church in this little village deep inland on the Isle of Wight has ever been a place of pilgrimage as such. If so, the fact is not mentioned in any history of the parish I have seen - though there was a Benedictine priory nearby at Appuldurcombe. But All Saints seems to me like a pilgrim church. 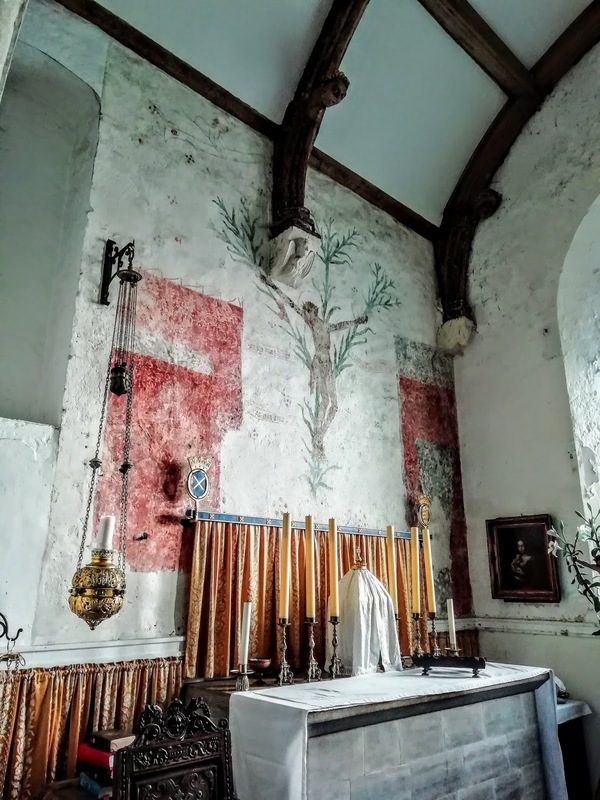 Up a steep hill above the village, with its medieval lily cross on the wall above the reserved Blessed Sacrament, it somehow asks to be approached quietly, with reverence - not for the building, but for what it means - as at the end of a long journey. Pilgrimage is increasingly a pattern that calls to me. As I wrote elsewhere here, "We cannot know the way; but our steps are indeed ordered by the Lord (Proverbs 20.24), if we love him, and will only draw near to him in prayer. He simply says, as he always does, 'Go', or even 'What is that to you? Follow me!' (John 21.21)" Somehow I find I no longer have the need I once had to be sure of the way.